If Buffalo equals bad weather in your book, this first-of-a-kind kid-friendly guide will prove that this image is a real snow job. All About Buffalo casts a vibrant spotlight on the city's rich history, cultural diversity and even its economic challenges. Written by Maria Scrivani and illustrated by Michael Morgulis, this breezy, full-color guide demonstrates that kids can get a hands-on history lesson merely by exploring their town. Scrivani was inspired to write this unique book during a trip to the Big Apple. "I was talking about Buffalo to a class of New York City preschoolers one day and realized their many questions about my city all centered on the weather," she recalls. "Clearly, that was all they had ever heard about the second-largest city in their state." When Scrivani returned home, she tried to find some books to send the youngsters. She couldn't find any tomes that were age-appropriate. Her fruitless search gave birth to All About Buffalo. Scrivani shared her vision with prominent Buffalo artist Morgulis, who eagerly accepted the challenge to illustrate the book. Scrivani's vivid text spurred Morgulis to depart from his usual style of simple, spare imagery. "Maria's thought-provoking information pushed me in the direction of presenting the images in series of `combines,' or visual collages," Morgulis said. "All of it together makes for a great story about a great city." All About Buffalo covers a lot of ground in its 32 action-packed pages. Young readers are exposed to everything from the city's Native American heritage, to its growth during the Erie Canal Era. In easy-to-understand terms, the book illustrates how the city has had to economically reinvent itself every few decades. Readers learn about Buffalo's transformation from a steel-manufacturing mecca to an emerging hub for high-tech industry and medical research. 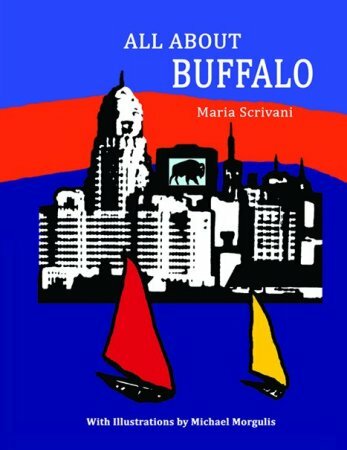 The book even includes a supplemental chapter that provides more detailed information about the people, places and events that continue to shape Buffalo's history. Hence, this guide geared to young readers is also appealing to adults who are interested in urban history and the challenges that face American cities.